This is a good day trip by car, by bus, or even collectivo. Head out early for Tulum. The drive will take you about 90 minutes. (Traffic gets heavy as you pass through Playa del Carmen) The site opens at 8:00 am. It tends to get very hot and humid at Tulum, so an early hour will let you beat the crowds and the heat. Note: If you are planning to see more ruins, we recommend seeing Tulum first. Seeing the spectacular Chichen Itza may “spoil” you for a small site like Tulum. Tulum is not a very big site, it’s main attraction is its spectacular location. 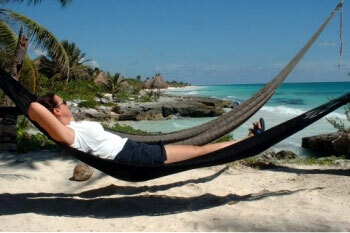 Most times when you see a tour book or magazine article on the Yucatan peninsula, the cover picture will be Tulum. It will not take you long to see the site. If you plan ahead and wear your swimming attire, you can run right into the ocean right at the site. Tulum is the only museum I know that has a beach! Now you have a decision to make, you can either go on with the day trip or walk south outside the gates and head for one of the little cabana hotels and spend the rest of the day on the beach. Lonely Planet voted the beaches at Tulum as one of the top 10 in the world, and we think they’re right. The beach is dotted with small hotels and restaurants, but it never feels crowded. If you decide to go on, head for Coba. (You can always come back to Tulum later) This is a very large site that is still covered by jungle. There is plenty of shade but also mosquitoes, so bring your repellent. The site is so large that you can rent a bicycle for around 25 pesos. We didn’t but wish we had. The pyramid at Coba is the highest in the Yucatan. Hope you brought good shoes! Now you have another decision to make. You could go north here and see Valladolid or go back to Puerto Morelos that way, or you can drive back to Tulum and meander your way up the Maya Riviera. The town of Tulum has a number of shops & restaurants, but for the real experience of Tulum, keep going on the Coba road and head for the beach. The road north and south is lined with small hotels and restaurants and bars. They are all very small establishments though and do not spoil the beautiful beach. This is no Cancun hotel zone! You may wish to spend the night in one of the hotels. Most are very rustic with cabanas right on the beach. Most have electricity for only a few hours a night, candles are provided. Muy romantica! Cenotes: You will pass many cenotes on your way home. These are freshwater underground lakes that are great for swimming, snorkelling or diving. There may be a small charge for admission. Akumal: Beautiful beach and snorkelling. Many Americans and Canadians have homes here. Paal Mul: Of special interest to RV’ers, this area has been taken over by Canadians and American campers. Some have cemented their units in permanently and covered them with huge and elaborate palapas. Playa del Carmen: A former sleepy fishing village much like Puerto Morelos, PdC did not grow, it exploded! Depending upon whom you believe this is either the fastest growing city in Mexico, Latin America or the Universe. Beautiful beach packed wall to wall with restaurants, bars and international tourists. The main street, Fifth Avenue has been pretty much handed over to pedestrians. A good place to walk, shop or have a meal. Shop owners and restaurateurs and the occasional timeshare hawker will aggressively solicit your business. You can catch the ferry to Cozumel in downtown Playa del Carmen. It’s a 42-minute ride and costs 140 pesos each way. Playa Secreto: Shhh. A very rough road to a very nice beach. Lots of stylish homes & condos, but no town. If you have a meal in Playa del Carmen, have a close look at your bill. Many restaurants add 15% for service but do not tell you, causing you to tip twice. We had one tell us it was a restaurant tax. Hooey! Restaurants in Playa are very competitive. Many will entice you in with low priced entrees but nail you with over-inflated drink prices that are not on the menu. If your budget is tight, make sure you know what you’re spending. Many restaurants will hand you a card good for a free round of drinks or a percentage off your meal. Look for them. The highway is very good quality, but everyone drives too fast. Drive the speed limit, especially the long 80 km/h (50mph) zone around Playa del Carmen. Local police watch this area very closely. Watch for topes (speed bumps) too on the highway in this area. Bring sunscreen and wear a hat at Coba & Tulum. The sun is strong and the shade is scarce. We bring water too. Wear good shoes. You will be doing plenty of walking and the steps on the pyramid can be smooth, slippery and steep. You should really have a good map and a guide book to get the most out of this trip. Why not drop by Alma Libre Bookstore before you go.